Grocery spending can become expensive for families. Here are some tips to tighten the budget. The average family spends several hundred dollars on groceries each month. It is possible to spend $200.00 or less on your groceries each month! Even if you have three or more children. ** First: pay attention to how much each item costs and compare! Store brands are generally cheaper than name brand products. No, the grocery store does not make their own foods, they contract out to a company who does. Many time one factory will make a food and package them differently for different companies, yet what is inside the package is the same! Don't assume that the store brands won't taste good. ** Use coupons on items that are on sale. But check to make sure that it is the best deal before putting it into your buggy! ** Bulk purchase sale items. When something goes on sale for a great price, buy enough to last until the next sale. This ensures that you will pay the lowest possible price for that item. You won't have to purchase it again at a higher price. If you have a small kitchen or little cabinet space, look for other places in your house to store canned goods. Under the bed, in a little used closet, under that accent table covered with a table cloth, etc. ** Don't buy non-food items at the grocery store. The prices are often inflated. The store gets you for the convenience of buying it there. ** Go over sale flyers weekly and purchase loss leader items. Good time to use those coupons! ** Get a supermarket discount card if your store offers one. We have a little key ring with all the different store's cards for our area. We keep it in the car. ** Don't buy convenience foods. Bake cakes, biscuits, pasta salads, etc. from scratch. You may feel that you do not have time to bake. But think about the amount of time you spend in the grocery store purchasing these convenience foods! If you aren't a great cook, practice! Get a good basic cookbook and follow the directions precisely. Easy! Just pay attention to what you are doing. Besides costing less, homemade foods taste better and are healthier for your family. ** You should never have to pay more than $1.99 for a box of cereal. Cereal is one of the biggest rip offs in the store. With the coupons we use, we never pay more than $1.99 a box and often less - for name brands. But the generic brands are really good, too! Hot cereals are healthier. We eat a lot of oatmeal, farina (Cream of Wheat) and grits in our home. Check your local health food store for bulk purchasing these cereals. At our store, farina, which is the same thing as the box of Cream of Wheat, costs only $0.45 a pound! ** Never, ever, throw away leftovers. And don't let food go rotten in the fridge! Make sure leftovers are used up. Before cooking, take an inventory of what needs to be used up. In our house we use everything. Even the juice in the canned fruits. Our children must eat everything on their plates. If they don't, they do not get dessert. If they are truly full, they know they are welcome to finish there leftovers for the next meal before eating what we have prepared for the next meal. Since we are consistent on this, we never have a problem. We also don't allow snacking between meals (except on occasion). This ensures they are hungry when they sit down to eat. And for the most part they clean their plates at every meal. We have also taught our children to eat all their potatoes, including the peel, as well as eating their crust. People are always amazed at how well our kids eat! 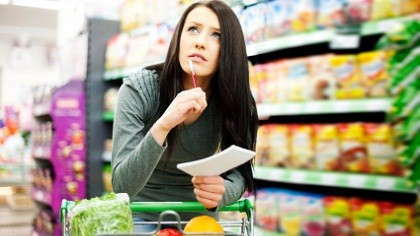 ** Plan what you are going to buy before going to the store. ** Buy bread at your local day old bread store. You can find loaves of wheat bread for as little as $0.25 a loaf! ** If you live near a salvage food store, shop there routinely. Great deals on dented cans and speared boxes. Canned goods are safe unless bulging. Check for leaks and broken seals before buying. ** Shop at wholesale warehouses where you can bulk purchase items. But as with any other type of store, compare prices. Bulk items are not always the best deal! Be aware of what you are spending. ** Don't impulse buy!!! If you are really craving something, drink a large glass of water and resist the temptation. ** Become a vegetarian. Think of all the money you will save not buying meats! ** Plan to eat dried beans two to three times weekly. At as little as $0.89 cents a bag, a pot of bean soup is a fantastic way to feed your family cheap and healthy at the same time! ** Grow a garden and freeze or can the excess. Gardening can save you lots of money on fresh produce. If you find a source of inexpensive produce (free is best!) spend a few days canning and freezing for later. It is easy enough and although it can be time consuming, is well worth the effort. We canned 50 lbs. of tomatoes this May. We would have canned more except that we had to go out of town. Someone gave us enough peaches to make a few jars of peach jam. And my mother in law gave us 15 flats of strawberries! Boy, were we busy canning them! But the jam and frozen fruit is so nice to have on hand. And they make nice gifts for Christmas! Add a loaf of homemade bread and its a great gift. ** Keep a record of how much items cost and how much you spend each week. Note how much you are spending on WANTS (chips, soda, etc.) and how much you are spending on NEEDS (beans, produce, soy milk, etc.). The first time I did this years ago, was I amazed. That very day I determined to no longer buy junk that I didn't need anyway. ** Don't buy sodas. They are bad for you, make your kids hyper, promote loss of calcium from your bones, and are empty calories that nobody needs. ** Make your own potato chips in the oven at home. As well as hash browns, and french fries. ** Leftover vegetables can be used in casseroles as well as stir fry or soup. Be creative! ** Don't go to the store hungry. Eat a good meal before you go. ** Check to see if your store offers rain checks on items they have sold out of. ** Take advantage of free samples at the pharmacy in the grocery store. Often there is a basket of aspirin or nasal medication at the window. Don't be shy. Everything comes in handy sometime. So what are you going to do with all this extra money you have? Don't go out and blow it on something else! Be wise and your family will benefit in the long run. Begin paying extra toward the principle on your mortgage. Put the money into a savings account and leave it there! Cut up that credit card and use this money to pay off your debt! Use the savings to purchase something that will help you save even more money, such as your own lawn mower so you don't have to pay the boy down the street. Or a saw so you can cut your own fire wood instead of buying it from someone else. Think about how you spend your money. There are thousands of ways to cut back, use less, and save more! Melissa Ringstaff is a wife, mommy, homemaker and the director of A Virtuous Woman, an online women's ministry based on Proverbs 31. You can visit A Virtuous Woman at http://www.avirtuouswoman.org or you can email her at mailto:[email protected] .